Social psychology has much to offer real world problems, especially in industrial and organizational settings. Originally published in 1995, in Social Psychology at Work leading researchers in their respective fields discuss recent findings and their implications for the commercial world of work. All the contributors have been greatly influenced by the late Michael Argyle, to whom this book is dedicated. They examine aspects of the workplace from the perspectives of personality and individual difference, social psychology and organizational psychology. Subjects covered include the effects of age on work, leadership, productivity, how we are socialized for work, stress and anxiety, and the effect of the physical environment on working behaviour. 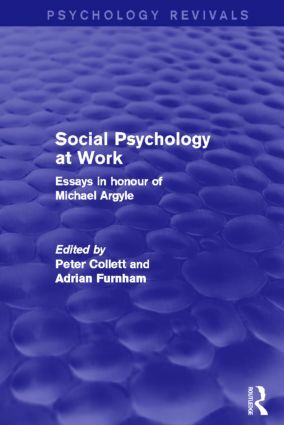 Social Psychology at Work is a rich source book of ideas, research findings and reviews at the interface of pure and applied psychology. It will be important and rewarding reading for all those such as students, consultants and managers and trainers who are interested in psychology at work.